Slim Bomb T5 is a weight loss supplement marketed by Slimming Solutions. The company is based in the North East of England and sells a range of health and fitness products from their website. They also have eBay and Amazon Stores, but it is hard to determine whether the company is responsible for manufacturing the products they sell or if they are just adding their name to private label products. Slim Bomb T5 is a relatively new addition to their range and Slimming Solutions says the product assists weight loss by suppressing the appetite and boosting the metabolism, so—in a nutshell—the capsules are designed to help the user eat less calories each day, while also enabling them to burn off their existing body fat. Slimming Solutions attribute much of the blends (supposed) power to its ability to stimulate the production of T5 fat burners—hence the name. Contains some potentially good ingredients. T5 is just one of several hormones produced by the thyroid gland. T5 is believed to encourage a faster metabolism and improve the body’s fat burning abilities. Products that profess to encourage this reaction rely on synthetic and/or natural compound that can initiate the production of T5 within the body. Slimming Solutions promise theirs is a “natural weight loss supplement” so in this case a blend of natural ingredients are used to trigger the production process. According to the product sales page the recommended dose is one to two capsules each day, but Slimming Solutions fail to mention if both capsules should be taken together and they do not provide any insight into how consumers can attain the best results from the product. Slimming Solutions state the product contains 300g of guarana seed power, but do not elaborate on whether this is the amount contained in a single capsule or a dose of (possibly) two capsules. No other inclusion rates are provided. Guarana Seed Powder Extract: A potent source of caffeine. Guarana is usually used to provide extra energy and encourage a more alert state of mind. Caffeine has known side effects, but guarana releases its caffeine content more slowly than most other caffeine sources, so its energy-providing effects are longer lasting and side effects are less likely to be an issue. Siberian Ginseng Extract: Siberian ginseng is from the same family as true ginseng, but it does not share the same genus. Both forms offer a variety of health benefits and recent studies suggest true ginseng may have value as a weight loss aid. It is certainly possible that Siberian ginseng may share this ability, but it has never been subjected to the same tests as its more powerful cousin. Capsicum Extract: A tested and proven ingredient that is a common inclusion in weight loss formulations. Tests show capsicum has the ability to inhibit the growth of new fat cells and can also enable the body to burn off calories up to 12 times faster than normal. Kelp Extract: Kelp is usually included in weight loss supplements due to its high iodine content. Iodine is necessary to thyroid health. An unhealthy thyroid can lead to a sluggish metabolism, so this addition may offer some benefits. Recent studies, conducted at Newcastle University (UK), and published in the journal Food Chemistry suggest kelp may also contain a compound that has fat blocking properties and may block up to 75% of ingested fat. Apple Cider Vinegar Powder: Some studies suggest apple cider vinegar can suppress the appetite and boost the metabolism. Maltodextrin: A strange inclusion for a dieting supplement. Maltodextrin’s high carbohydrate content makes it a useful inclusion in bodybuilding blends because it provide the body with extra energy, but the ingredient can cause a spike in the blood sugar level that commonly results in cravings for sugary foods, overeating, and weight gain. Magnesium Stearate: A very controversial ingredient that may be dangerous to the health. It is often used as a binder or filler ingredient, but it may be toxic. There are also several other issues relating to its use and many medical experts are pushing for a ban. 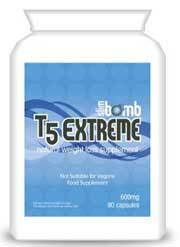 T5 Slim Bomb will be unsuitable for vegetarian use due to the gelatin contained in the capsule casing. At the time of this review no customer feedback could be found. The caffeine content (from the guarana) may be an issue for some users, but the inclusion of Magnesium Stearate offers the greatest cause for concern. Potential users are advised not to use T5 Slim Bomb unless its use has been approved by their doctor. Purchases can be made from the Slimming Solutions website. In this particular genre we would highly advise looking at Capsiplex. 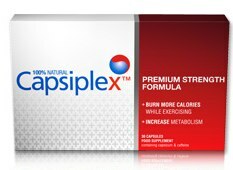 Capsiplex is a thermogenic fat burner that can help user burn fat and continue to burn calories throughout the day. Capsiplex is made from a high dose of capsicum extract (Slim Bomb T5 also contains this but to a lesser degree) – its makers suggest that Capsiplex can burn a similar amount of calories as cycling for 40 minutes.